On this webpage you can view the first five minutes of the video conversations with four Berlage Institute studio professors. 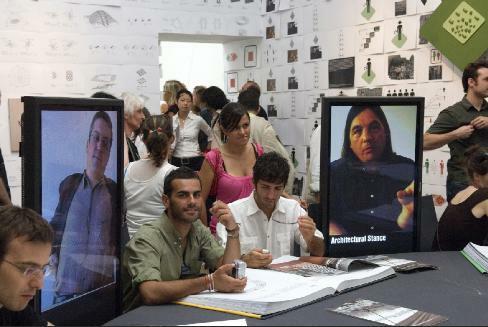 Four vertical placed LCD monitors "sitting at a table" invite the audience to participate. The total conversation is about 50 minutes. The interviews are held by Jennifer Sigler and Roemer van Toorn. Camera, editing and technique of the installation was in the hands of Zuis Amsterdam (Karel Poortman, and Neeltje van der Haak). The video installation was directed by Roemer van Toorn. The four studio-professors of the Berlage Institute Rotterdam who are interviewed are Markus Schaefer, Yushi Uehara, Pier Vittorio Aureli and Peter Trummer. They talk about their urban research project in respectively Ljubjana, China, Moscow and Madrid. Each professor either answers the questions, looks around or shows materialof specific interest (like books, quotes or studiomaterial that was of inspiration) while one of the others is talking to the public. 1) Matter of Facts. City, Society and Architecture. 3) Expertise; Scripting, Negotiation, Representation, and Associativity. 4) Projecting the City; Ljubljana, Shengzhen, Moscow, and Madrid. 5) Projecting the City; Light Capital (Markus Schaefer), Village in the City (Yushi Uehara), Capital Cities (Pier Vittorio Aureli), and Neighboorhood Models (Peter Trummer). In the exhibition itself more detailed information on the projects researched can be found on the four walls behind each speaker (and in the projectbooks on the table). 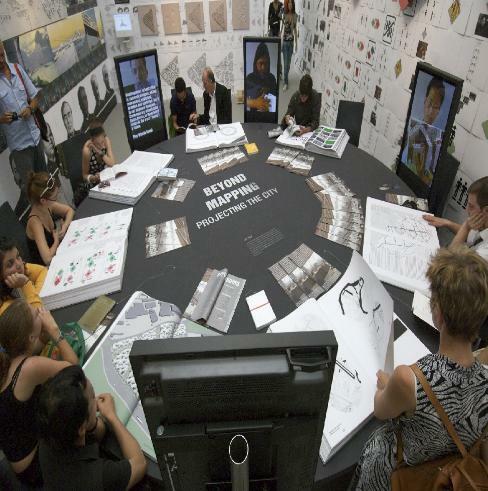 Talking and debating the result (ideas and positioning) is meant to go first and upfront, while the recording of the material (tools and pragmatics) takes a second stage in the background of the installation in physical form.